Mr. Duncan Kane from Toshiba joined us to honor our award recipients in the Exploravision National Competition. More than 14,000 students participated and there were more than 4000 projects submitted. 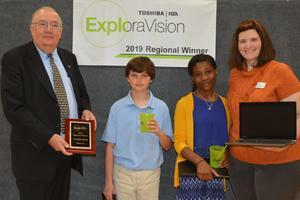 Six regional winners are selected, one from each region, to move on to compete in the National Competition. James and Rickayla developed a website and prototype to share about their invention the ADHD watch.